In an era of increasing software bloat there's something to be said for a small, efficient application that goes about its business without fanfare or distraction. Drive Power Manager ($15, 21-day free trial) weighs in at a mere 1.5 MB fully installed and has a single function: To provide component level access to hard disks and optical storage devices, allowing highly granular control of power usage, performance, standby, and noise settings. The interface is simplicity itself, with all functions available via a single window per drive. Drive Power Manager applies changes immediately, with no rebooting required. Every option Drive Power Manager offers is available from a single window. Laptop users are always seeking to extend battery life, and it's here that Drive Power Manager makes its biggest impact as hard disks and optical drives can represent a significant power drain. With disk power usage properly leashed, useful improvements in operating time can be realized. Default battery management systems can address some of these issues, but often fall short in practice, compromising usability. Since Drive Power Manager allows discrete settings for each drive's features, finding a sweet spot to accommodate individual usage patterns is a snap. Of particular note is the welcome ability to cap peak RPM and quiet optical drives, a virulent problem with laptops, where a spinning DVD can make an entire system vibrate like a coin-op bed in a cheap motel. 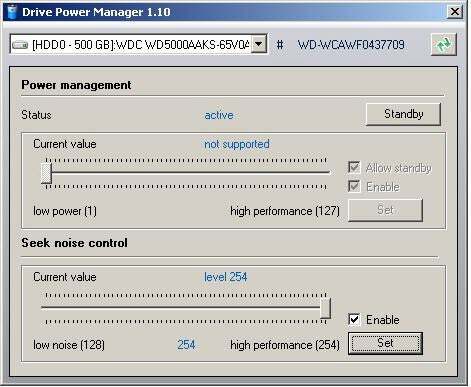 Drive Power Manager also include a series of speed enhancement options, but these have a more modest effect on system performance. Both real-world usage scenarios and synthetic benchmarks show few objective gains, but subjective impressions are another matter. With drives taken off standby and idle timeouts reduced or eliminated, notebook systems felt more responsive, avoiding the irritating wait involved with disks spinning up or recovering from sleep modes. The trade-off for this is decreased battery life, but for a user who spends much of their time plugged in at a desk, that's not a problem. For all its tight coding and efficiency, there are some issues with Drive Power Manager. Better hardware support would be welcome, as some older drives seem to register correctly but return errors when changes to settings are attempted. Check out target system compatibility with the fully functional, time-limited trial version to avoid potential problems in this area. The addition of profile settings that automatically adjust for ac/battery usage would also extend usefulness, rather than forcing portable users to perform manual adjustments each time they unplug. Website support is also thin and could use an overhaul. These are relatively minor issues, however, given the overall usefulness of the package. Laptop aficionados, especially those who spend a lot of time on the road, will find Drive Power Manager worth a closer look.